With over 35 years of experience, Hungry Howie's is consistently ranked as one of the Top 10 Pizza Franchises in the nation. From its humble beginnings in Taylor, MI, Hungry Howie's has grown to almost 600 locations in 24 states. For decades, Franchise Development has concentrated on steady growth; however, our focus has now shifted. We have established a solid infrastructure and we are poised for aggressive growth. Hungry Howie's is actively seeking qualified, ambitious candidates to join our growth campaign. Hungry Howie's mission is to bring family and friends together for the best possible value on a superb pizza experience with a fresh, unique, and personalized taste for everyone. Our goal is to live with integrity to enrich the families of our partners and the communities we serve for greater success in business, and in life. Look no further than our famous crust to see why Hungry Howie's has an EDGE over its competition. Mouth watering seasonings are baked into the edge of our pizzas making the last bite of a Hungry Howie's pizza just as good as the first. 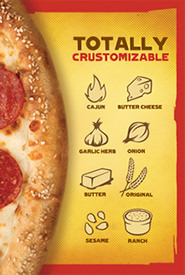 Baked subs, 4 different breads, chicken, and salads are the perfect accompaniments to our "crustomized" pizzas. 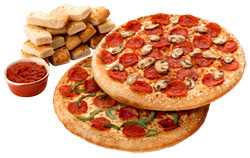 Others have tried to copy it, but Hungry Howie's is the home of the Original Flavored Crust. Prime areas are available for single or multi-unit development. Unlike many other large brands, multi-store operators can purchase entire territories. ***Hungry Howie's does not currently offer international development. Please note this franchise currently not accepting inquiries from AL, AZ, FL, HI, or MI. Please note interested parties should have at least $100K to invest. Hungry Howie's Pizza Franchise is currently accepting inquiries from the following states: Wyoming, West Virginia, Wisconsin, Washington, Vermont, Virginia, Utah, Texas, Tennessee, South Dakota, South Carolina, Rhode Island, Pennsylvania, Oregon, Oklahoma, Ohio, New York, Nevada, New Mexico, New Jersey, New Hampshire, Nebraska, North Dakota, North Carolina, Montana, Mississippi, Missouri, Minnesota, Maine, Maryland, Massachusetts, Louisiana, Kentucky, Kansas, Indiana, Illinois, Idaho, Iowa, Georgia, Delaware, Connecticut, Colorado, California, Arkansas, Alaska.